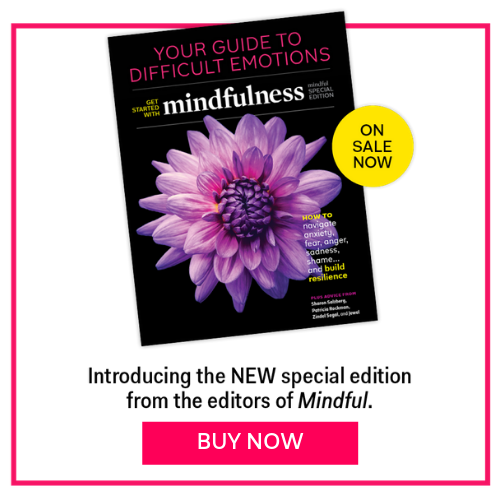 These 12 articles contain expert advice on how to work with your mind, understand your emotions, and practice being your authentic self. Mindfulness apps are trending in a big way. Here are three we’re happy we downloaded. You can learn how to create a moment of joy at any time of the day. Explore these 5 simple steps to enjoy more mindfulness. By following these simple mindfulness meditation steps, you can get to know yourself up close and personal. Elisha and Stefanie Goldstein offer 11 ways to slow down and stay steady when anxiety trips you up. Reduce stress, anxiety, and negative emotions, cool your temper, and sharpen your concentration skills. How what’s going on in your gut could be affecting your brain. Taking a few moments to pay attention to the body can have a strong impact on how the rest of the day unfolds. Practicing meditation doesn’t involve a whole new set of skills. It works so well because it enhances life skills we already have. The glitter jar represents the mind settling. It’s a great mindfulness activity that your kids can keep coming back to.